Instapaper is a unique service from developer Marco Arment that allows users to quickly bookmark webpages for reading later. Arment's iPhone clients (one free, one paid) can download copies of these pages in a format ideal for reading on an iPhone or iPod touch. 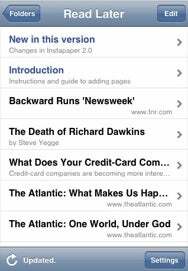 A major 2.0 upgrade to Instapaper Pro brings a wealth of new features. New in Instapaper Pro 2.0 is one of Arment's most-requested features: support for organizing articles into folders, which the online Instapaper service recently gained (at this time, Arment plans to keep this feature exclusive to the paid Instapaper Pro iPhone client). Users can also now star articles they like or found useful, and subscribe to each others' starred items for a bit of social Instapaper action. In addition, Instapaper Pro 2.0 can now continuously update your articles in the background, allowing you to read one while the others download. A new, thin toolbar provides access to frequently used features like star, toggling tilt scrolling (a feature only in the Pro version), layout customization, and an action button for moving the article to anther folder, emailing a link, or opening the original page in Safari. Users can now download the full graphical version of an article while reading it, and new "Feed Folders" allow users to subscribe to Instapaper-friendly sites for automatic article delivery. Instapaper Pro 2.0 is a small triumph for Arment, as it hit some unique snags in Apple's infamously opaque App Store review process. Nevertheless, it is now available in the store, and it's a free upgrade for existing Instapaper Pro owners. To celebrate the release, Arment is running a 50% sale for new customers, discounting Instapaper Pro from its regular $10 price to just $5.